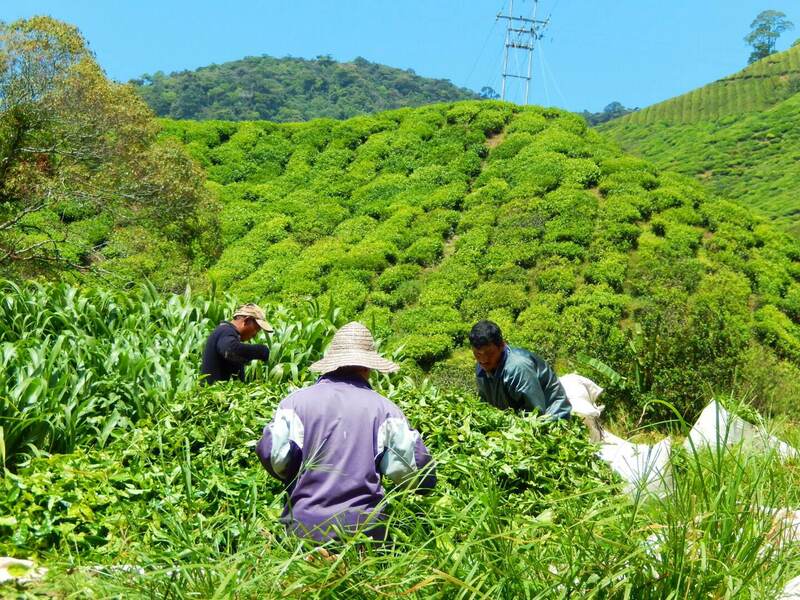 One of the favourite weekend destinations of Malaysians is the cool air of Cameron Highlands. It’s named after the British surveyor that “discovered” this serene getaway around 130 years ago. The climate in this hill station is temperate and constant and the landscape is heavenly. Given the presence of the British, it may not be surprising that it wasn’t long before this area was transformed into a large highland tea plantation, with farming and production continuing to this day. The hotel I stayed at was at an elevation of around 1,600m above sea level. I cannot forget being woken at dawn by the sunrise over the mountainous horizon with the early morning fog billowing between the troughs of the not so distant hills as if I was looking into a smoking cauldron. I stood and gazed as nature coursed through her cycle and the morning mist dissipated, revealing the contours of the land. My hotel was a little removed from the town center but I chose it because of its proximity to the trekking paths, most famously Gunung Brinchang (Brinchang Mountain). I would leave my hotel and trek around 40 minutes to get to the hiking path then another couple hours to trek up to the peak. The distances were always longer than I expected, and the steep grade made the walk to the path a trek in itself. I joined up with a day tour to see more of the sights and I was fortunate to make the acquaintance of a couple of Dutch travelers. It’s always great to make friends as you travel and it the experience is made more worthwhile when shared with others. Another great thing was that they shared a few pictures with me so I can share them with all of you and give you a taste of the tranquil beauty of this tropical landscape. After Cameron Highlands I traveled some 250km north on a bus then took a ferry to the island of Penang, known as the Pearl of the Orient. The climate here was again hot and humid. The settlement of Georgetown on the east coast of the island contains a UNESCO world heritage site owing to its status as a former British colony and the presence of numerous colonial-era buildings. It was here in Georgetown that I had one of my most memorable experiences of Malaysian people. I was roaming around the downtown area as I normally do when I’m traveling and hopped into a pub for a bite to eat. There was a group of five gentlemen sitting close to me and they greeted me when I entered. Three of the group were lawyers, one was a journalist, and one was a banker. We exchanged some pleasantries and some remarks on the World Cup then quickly delved into Malaysian law, politics, and the mysterious disappearance of that airplane. The group kept growing as the time went on and we were joined by another couple of lawyers and a restaurateur. I felt so comfortable and welcomed and the conversations were in depth and intimate. We joked, we laughed, and the libations continued to flow. The next day in Georgetown I decided to go to Batu Ferrenghi, which sounds like something out of Star Trek. It is a beach area on the northern coast and the name translates to “Foreigner’s Rock”. This was apparently the place where the British first landed, or so they say. The sand was a little course and grainy and unfortunately there were jellyfish in the sea, but the great thing was the watersports that were on offer. I rode a jet ski on the azure water and I tried parasailing for the first time. I expected a thrilling adrenaline rush but actually it was a laid back, relaxing experience of floating in the air like a cloud as the motorboat skipped over the water below me and pulled my parasail in large circles. This trip has been incredible so far but it will soon end. I will give you my update on Singapore, which is my last stop, and some reflections on what I’ve learned. I hope you have been enjoying these and I wish that you could be sharing these experiences with me. I feel so lucky that I have had the opportunity to do this and now that I’ve tasted it I just want more. More travel, more adventure, more everything.